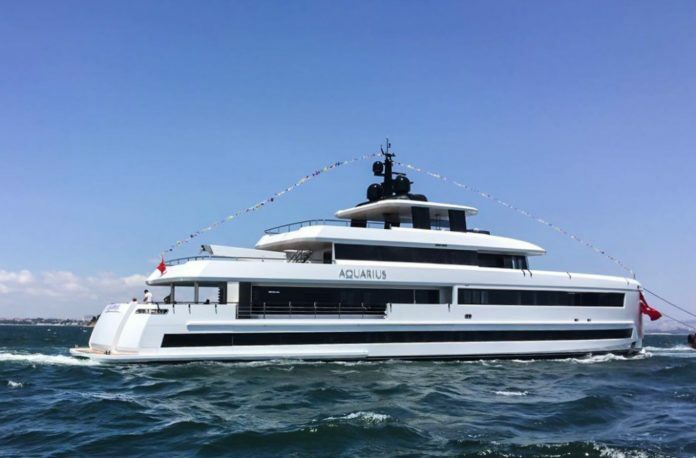 Turkish shipyard Mengi Yay’s latest delivery is the 45-metre yacht Aquarius, which was launched in June this year and since then she has been cruising around the Mediterranean. Aquarius is a tri-deck displacement yacht built with a wooden laminated epoxy hull and engineered by long-time collaborators Ginton Naval Architects. 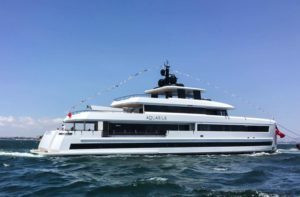 Her overall exterior design is by Oğuzhan Güler, and it is characterised by sleek and straight lines drawing the eye to her almost vertical prow. Aquarius’ interiors are work of Autoban & BTA Design, which has drawn the vessel’s internal volume of 300 gross tonnes into beautiful spaces. Indoor areas include a spacious full-beam main saloon featuring large windows and twin fold-down bulwarks on either side, which offer very good views. The fold-down bulwarks are just off the formal dining room and enhances the dining experience when at anchor. Exterior entertainment and relaxation areas include the aft beach club, with port and starboard fold out sections and an extendable bathing platform; the sundeck featuring a large sun pad aft on the hard top; a stylish beach club which can be opened up on three sides when at anchor. Accommodation onboard is composed of a master suite located forward on the main deck, four guest cabins and four crew cabins for a total staff of eight. The master suite is spacious, with two balconies on either side which provides the owners with their private space to walk out. The aft bridge deck can be arranged to host a tender or store other water sport equipment or toys. A couple of 1,450hp CAT C32 engines power the vessel, allowing for a top speed of 15 knots. Cruising speed of 12 knots will deliver the maximum cruising range from the 33,000 litre fuel tanks.